Teddy Bear Costumes are not for everyone I know. Many think that a teddy should be a teddy and that their lovely plush should be all the adornment they need. However dressed bears and character bears or bears dressed to look like famous real life people and film characters has become increasingly popular. Costumes for bears are rather different than just dressing up a bear in some clothes. In many ways it is not only more fun but also can help to teach children about history etc through a medium they can understand. For Instance many choose teddy bear costumes which represent famous historical characters or to represent certain periods of history such as the World wars. Dressing teddy bears in clothes has become steadily more popular and in recent years has become a whole separate area of collecting for some. Here are just a few examples of the types of costumes that have adorned our beloved bears. Looking To Buy Clothes for Your Teddy? These are the latest teddy costumes listed on eBay, a great place to pick up a bargain. In 2006 the Teddy Herman Company in Germany produced a Mozart bear to mark the bicentenary of his birth. This bear not only sported a powdered wig and lush velvet jacket but also a violin and bow in his paws. The little Violin also played the tune Eine Kleine Nachmusik too just to make sure that this bears character could not be mistaken. 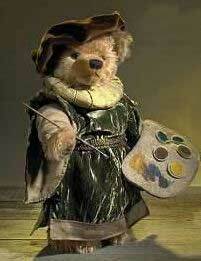 Teddy Herman also produced a Rembrandt bear to mark 400 years since his birth. This bear had a jaunty black berrie, a fur lined coat and paintbrush. Another rather outstanding teddy bear costume was made by Lisa Rosenbaum. Her chosen historical character was Abraham Lincoln. 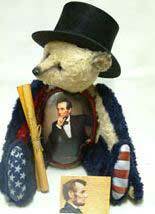 This teddy bear was not only dressed in Lincolns famous top hat but he also had a portrait of the great man painted on his chest. The bear also sported the stars and stripes of the American flag on his feet. Costumes for bears can also represent specific periods in time too. 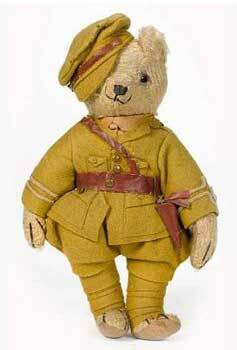 One of the earliest teddy bear costumes was of the Ally troops during the First World War. These "Ally Bears" made by the British company Harwin and were dressed in Military uniform often representing different ally countries forces i.e. army, navy and air force. More recently Jo Greeno created a set of teddies called the "Evacuee's". Inspired by photographs of children clutching their teddies during the war, waiting to be moved away from their famines into the countryside. Dressed simply in clothes from that period, each bear holds its own small bear and beside them a suitcase with a single destination label attached. These bears evoke powerful emotions. More recently popular costumes have represented characters from TV shows or films. Walt Disney characters such as Cinderella or Tinkerbelle are popular dressing up characters for girls to enjoy. 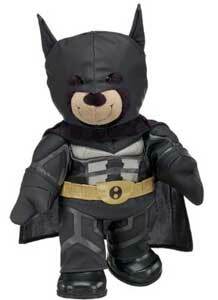 While boys have been catered for with character from films such as, Batman and Spiderman teddy bear clothes. One of the main companies catering for the children's market for costumes for teddies is the Build a bear workshop. They have cleverly designed a whole world of dressing up options for their own bears. Children can now have whole wardrobes of clothes and accessories for their teddies and I'm sure parents are very happy about this too.